The month-long Amar Ekushey Grantha Mela, which brought together a diverse mix of the country’s well-known writers, as well as up-and-coming authors, thinkers, and entertainers on one stage, will come to an end tomorrow following extension of two-days. 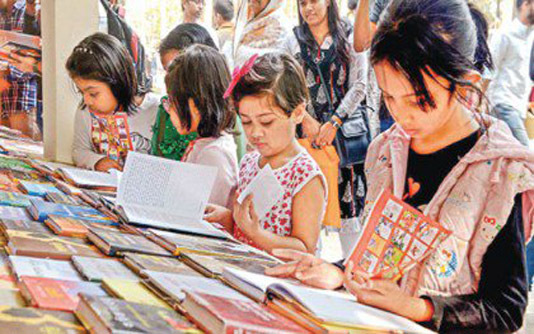 The month-long Amar Ekushey Book Fair, an annual event arranged throughout February for bookworms, publishers and writers, is drawing to a close on Saturday despite all formalities were done on Thursday, the last day of February. On February 1, Prime Minister Sheikh Hasina inaugurated the month-long fair that is arranged by Bangla Academy on the premises of the academy and its adjoining Suhrawardy Udyan. Some 770 stalls of 499 publishing houses and other institutions are taking part in the fair whose theme of this years’ is “from 52 to 71, from 71 to 19-new era”. On Thursday, Bangla Academy Chairman Professor Emeritus Anisuzzaman chaired the formal closing ceremony which was attended by State Minister for Cultural Affairs KM Khalid as the chief guest. Academy’s director and Amar Ekushey Book Fair member secretary Jalal Ahmed presented the report of the fair while Bangla Academy director general Habibullah Siraji delivered the welcome speech. Jalal Ahmed said the academy has sold books worth Taka 2.15 crore. According to stall owners, the total book sale this year was 10 percent higher than the previous year. A total of 4685 new books have hit the fair till the 28th day on Thursday, which has already surpassed last previous two year’s release of 4134 and 3646 books respectively. Bangla Academy has handed over the ‘Kabi Jasimuddin Award-2019’ to poet Nirmalendu Goon who is an Ekushey Padak winning litterateur. Besides, Chittaranjan Saha Smriti Puroskar 2019 was given to publishing house Katha Prakash for publishing maximum numbers of quality books in 2018. Prothoma Prakashani, Journeyman Books and Chandrabati Academy jointly won Munier Chowdhury Smriti Puraskar 2019 for publishing ‘Bidrohi Ranaklanto’, a biography of national poet Kazi Nazrul Islam, written by Golam Murshid, ‘Monorathe Shilper Pothe’ by Moinuddin Khaled and ‘Muthor Bhetor Rod’ by Maruful Islam respectively. Rokonuzzaman Khan Dadabhai Smriti Puraskar was given to Panjeree Publications Limited for publishing maximum numbers of quality books on children in 2018. Madhyama, Batighar and Panjeree Publications Ltd were conferred with Qayyum Chowdhury Smriti Puraskar for aesthetic decoration of their stalls. Two cultural functions were also held on Bangla Academy premises and Suhrawardy Udyan to mark the formalities to close the month-long book fair.